The Canadian dollar is weakening against several major currencies to start the trading week as the loonie is still reeling from bad data. The dollar faced additional pressure on tumbling energy prices and investors sounding the alarm about Canada’s perpetual budget deficit problem. The loonie may get a bit of reprieve from a light-data calendar. According to Statistics Canada, national retail sales slumped for the third consecutive month in January by 0.3%, falling short of the median estimate of a 0.4% jump. Core retail sales edged up 0.1%, lower than the market projection of 0.2%. The last time the Canadian retail sector endured a three-month skid was in 2012. Motor vehicle and parts dealers posted a 1.5% dip, general merchandise receipts plunged 2.4%, and gasoline station sales dipped 0.4%. The inflation rate rose from a 15-month low to 1.5%, which was higher than the 1.4% forecast, as the consumer price index (CPI) recorded a massive gain of 0.7%. This is still well below the Bank of Canada (BOC)’s 2% target; the central bank believes inflation will stay under its target for the rest of the year. As a result, the market does not anticipate the BOC will not raise interest rates for the rest of the year. Earlier this month, the BOC kept rates unchanged, taking a more dovish tone than in previous policy meetings. The central bank said there was “increased uncertainty” pertaining to the time of future rate hikes. The next interest rate announcement is slated for April 24, and the market does not expect any new changes. Energy prices could not lift the loonie as May West Texas Intermediate (WTI) crude oil futures fell $0.80, or 1.36%, to $58.24 per barrel on the New York Mercantile Exchange. May natural gas futures were flat at $2.76 per million British thermal units. Oil remains one of Canada’s biggest exports and its movement impacts the economy more than other commodities. Last week, Prime Minister Justin Trudeau and his Liberal government unveiled the 2019 federal budget. Despite promising to balance the budget by this time back in 2015, the grits posted a deficit of $20 billion. Analysts are beginning to warn about the perpetual deficits under this government, which will only add to the ballooning national debt of nearly $700 billion. The market will now look ahead to the producer price index (PPI) and balance of trade later this week. 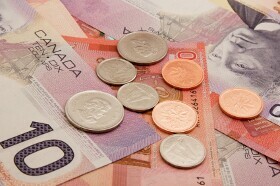 The USD/CAD currency pair rose 0.03% to 1.3433, from an opening of 1.3428, at 13:36 GMT on Monday. The EUR/CAD advanced 0.2%, from an opening of 1.5175.